The second edition of Saksham Pedal Delhi, India’s premier cyclothon, is all set to ensue in Delhi, on the 7th of October 2018. An initiative of Petroleum Conservation Research Association (PCRA), in collaboration with DO IT Sports Management (India) Pvt. Ltd., the event will be supported by oil & gas companies. The route mentioned in the map above will be closed on Sunday, 7th October from morning 4:30am to 10:00am on the occasion of the cyclothon. Scheduled to be flagged off from the iconic Jawaharlal Nehru Stadium, the event will see participation from India’s finest elite athletes and amateur riders who will be competing for a prize money fund of INR 10 lakhs. Bollywood actress & fitness enthusiast, Disha Patani is also set to pedal at the second edition of Saksham Pedal Delhi this Sunday with Delhites. 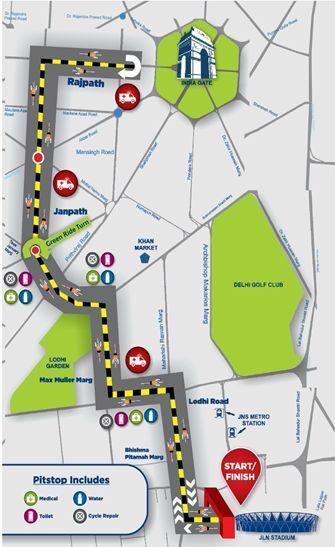 In line with the speak of last year’s edition, Saksham Pedal Delhi, 2018 will aim to profess the importance of socio-environmental consciousness by promoting cycling, both as a lifestyle and as an alternate means of commute, especially for shorter distances for day to day activities such as cycling to work, riding to nearby places etc. Not only does this save fuel/money but also keeps us healthy and fit contributing to the reduction of vehicular emission by reducing congestion and improving traffic flow. Mrs. Radha Kapoor Khanna, Founder & Executive Director of DO IT Sports Management said, “The first edition of India’s premier cyclothon received an overwhelming response from both, amateur cyclists and cycling enthusiasts alike. It was truly fantastic to see more than 5000 participants or superheroes as we like to call them, I am confident that the second edition of Saksham Pedal Delhi, will only be bigger & better”. World Cycling Alliance - an apex body of all cycling associations, launched to promote cycling, worldwide!